2) The Desktop software, MyZone Back Office, is used to manage the start-to-finish workflow. Use us for 30 Days Risk FREE. Upload unlimited events/galleries/sessions/products within photo count per selected plan. Use our web hosting solution for your proofs and on-line ecommerce in conjunction with your current web site. Grouping your events by galleries to make it easier for customers to find photos. Create multiple price lists and accessories for different galleries. Thumbnails and sample web images available for display on web site galleries. User Interface to modify the web site look and feel. Upload own logo and banner images. (1) Email addresses available only with purchase of hosting service with a custom domain name. 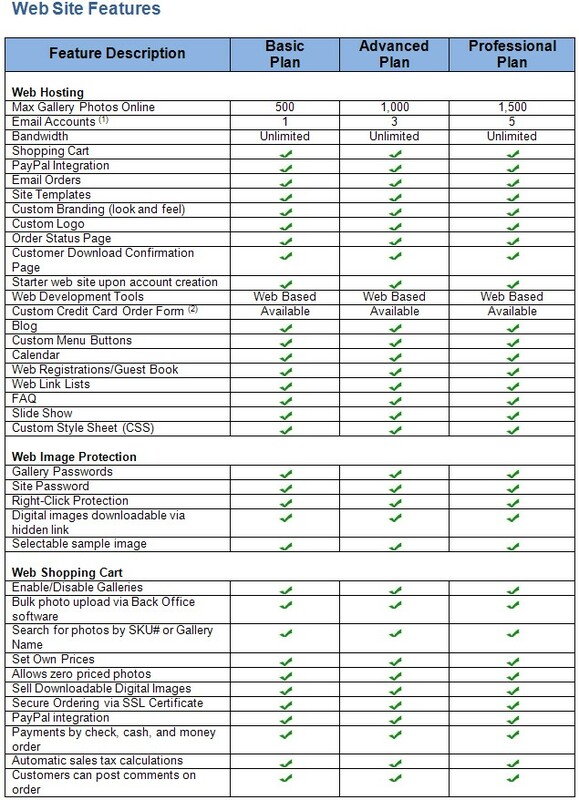 (2) Custom development rates apply for custom web forms to accept customer credit card information. Contact support@offsitelabs.com for information.